Detailed information about the author of this sermon, Carl Manthey-Zorn, was presented in the preface to his article, The Gospel, which appeared in Issue #4 of Studium Excitare. I almost should apologize for increasing the excessively large number of sermon books by adding yet one more. But I would rather tell you more about the sermons that are presented here. Perhaps well-meaning people will then approve of their publication. These sermons were composed and most of them were also delivered before a congregation in the course of the 1910-1911 church year, which was the final year of my activity in the ministry. They are my farewell sermons as it were. May the Word of God presented through this devotion give divine comfort and peace in the hour of sickness and death. Amen. While he was speaking this with them, behold! One of the rulers came and fell down before him, and he said, “Lord, my daughter is now dead. But come, and lay your hand on her; then she will live.” Jesus stood up and followed him, as did his disciples. And behold! A woman, who had had an issue of blood for twelve years, came to him from behind and touched the seam of his cloak. For she had said to herself, “If I could just touch his cloak, then I would get well.” Then Jesus turned around and saw her, and he said, “Take comfort, my daughter. Your faith has helped you.” And the woman was restored at that very hour. When he came into the ruler’s house and saw the flute players and the tumult of the people, he said to them, “Go away! The little girl is not dead, but she is sleeping.” But they laughed at him. When the people were driven out, however, he went in and took hold of her by the hand. Then the little girl stood up. And report of this spread into that entire region. 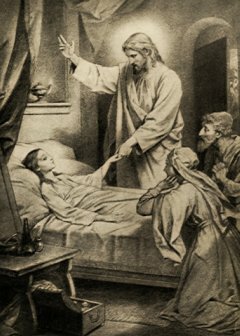 Jesus helps his own in sickness and in death. Hasn’t he helped the bleeding woman and Jairus’ little daughter? Jesus was in Capernaum and there, in one of the narrow streets, had to dispute with a mob that was crowding in front of him, including Pharisees, scribes, and disciples of John the Baptist. And behold! One of the administrators of the synagogue, Jairus, searched for Jesus. When he saw him, he fell at Jesus’ feet and pleaded with him to come into his house, for he had an only daughter of twelve years who was dying.1 He said, “Lord, my daughter is dying; she is now dead. But come and lay your hand on her; then she will live.” Jesus got up and followed Jairus. So did his disciples. So did the people. Soon they arrived at Jairus’ house. When he then entered into the house, he did not let anyone go in with him, other than Peter, James, John, and the child’s father and mother. Jesus saw the flute players and the mourners2, who were playing wailing tunes and singing as they wept. They were making a dreadful commotion. When he saw them, he said to them, “Why are you agitated and weeping? Go away! For the little girl is not dead, but she is sleeping.” But they laughed at him, knowing fully well that she was dead. He drove them all out, and went in where the child was lying. He took her by the hand and spoke to her, “Talitha koum!” Intrepreted, that means: “Little girl, I say to you, stand up!” Then her spirit returned, and she stood up immediately and walked. He ordered that she should be given something to eat. Her parents were astonished beyond measure, but he commanded them not to tell anyone what had happened. But this miracle became known in the entire region. In this way Jesus has helped the bleeding woman in sickness and Jairus’ little daughter in death. He also helps us in sickness and death. But why then are we told this event? So that we learn from it, who and what our Savior is, and that he is able and willing to also help us in sickness and death. But how? How then does he help us in sickness and death? Thirdly it is to be noted that our Savior has every sickness serve us, we who love him and love God through him, for the best. For we know that all things serve to the best for those who love God. If now the Savior has sickness serve us for the best, isn’t he then helping us? Yes, even if he does not take the sickness away from us immediately or at all, isn’t he then helping us, when he has the sickness serve us for the best? Health is good, but not the best. The best is the strengthening in faith to eternal salvation. To this best the Savior has every sickness serve those who love him as their Savior. In this way the Savior helps us in sickness in the best way of all. Certainly, call on your Savior in sickness. In the story of the bleeding woman you have seen what a master he is to heal and to help. He helps you too. Perhaps he does not help you in such an evident way as he did the woman, but he helps you. Either he has you recover, and then you should recognize and praise him in faith, or he gives you in great measure something better than health--his Holy Spirit for firm and ever firmer faith in him and at last eternal life through a blessed death. In death the Savior helps you just as much and better than he helped the little daughter of Jairus. This little girl he reawakened to this fleeting and unhappy life, in order to show that he has the power to help in death. You, O Christian, the Savior helps in death far better. For what does he most certainly do to you? Dying, as dreadful as it might even appear beforehand, at the time when the actual moment comes, he makes it for you like gently falling asleep with a prayer, which the Holy Spirit brings out of your heart for you before God, when your heart and thoughts pass away, like a light that flickers back and forth when its flame is lacking. You may here take your Bible in hand and read what is written3 in Romans 8:26, 27. As this is true about life, so it is true much more about the death of Christians. Then, in exactly this moment, your departing soul is carried by the angels into Abraham’s bosom, that is, to that place where all the pious have gone in so many thousands of years. Your frail body rests in the earth, and turns into earth. No human can awaken it. But the eye of Jesus sees your dust. Then, when perhaps years, perhaps decades, perhaps centuries are counted on earth – to you, however, all that is unknown and is one single blessed moment – you hear, yes you hear with your own two ears the voice of Jesus. John 5:28. You hear his mighty “Koum!” “Stand up!” And you stand up. You stand up fresh, new, glorified, heavenly, glorious, to eternal life. You stand at Jesus’ right hand at the great and dreadful judgment of the world. Then you go, together with all the elect, into eternal, everlasting glory. Jesus also helps us in death, doesn’t he? Yes, he most certainly does! Let us belong only to those who are his, his own! Amen. 2. The German word Zorn uses, Klageweiber, denotes female mourners, and also may imply that they were hired. The Greek word for “mourners” used in Mark’s gospel is actually masculine, and covers all genders. 4. The original German hymn, Alle Menschen müssen sterben, seems to have been a very familiar one to our Lutheran ancestors. Christian Worship unfortunately does not include it, but Hymn 601 in The Lutheran Hymnal is a fine translation by Catherine Winkworth.